McLuhan, Ong and Warhol offered a profound vision of media, a Catholic vision. Their Catholicism was not incidental to their theories and their art; it was their structure, their spirit and their sustenance. Fifty years later, their simultaneous creations feel somehow both particular to their moment and prescient. We might even call them transcendent. All oracles must divine from somewhere, and McLuhan’s source was Pierre Teilhard de Chardin, S.J. Teilhard had conceived of the “noösphere,” an evolutionary phase in which a “thinking skin” covers the world. This “stupendous thinking machine” of a collective consciousness sounds much like a biological internet. Now imagine how Teilhard’s wild theory sounded to an academic like McLuhan, a literary scholar seeking patterns and connections in the history of media and communication. Their Catholicism was not incidental to their theories and their art; it was their structure, their spirit and their sustenance. Even that, it seems, was trouble. Although McLuhan’s conception of the “global village” created from technology was clearly indebted to Teilhard’s noösphere—consider lines like “the evolutionary process has shifted from biology to technology in an eminent degree since electricity”—he shied from acknowledging the French Jesuit’s work. In his book Hooking Up, the writer Tom Wolfe offers two reasons for this. As a Catholic convert, McLuhan was “highly devout,” and “the Church had declared Teilhard’s work heterodox.” And despite McLuhan’s private aspirations in his letters, he was a member of the secular intellectual community and had to avoid overt religious references. The Medium Is the Massage is the work of a theorist at play. The book contains mini-essays, prose poems and typographic puzzles, juxtaposed with complementary and contrasting images, photographs, drawings, clippings from media and excerpts from James Joyce (the book was a collaboration with graphic designer Quentin Fiore). Although McLuhan’s particular focus was on television, he was clear that “all media work us over completely.” (Hence the massage: We are rubbed and relaxed by media. We enter another state). In the electric river of television, “information pours upon us, instantaneously and continuously.” As a viewer, “images are projected at you. You are the screen. The images wrap around you. You are the vanishing point.” If “electric technology fosters and encourages unification and involvement,” it also disallows escape. The digital world is not going anywhere, and neither are we. McLuhan’s detractors are skeptical of his pithy lines. He would smirk at their condemnations. McLuhan had a particular ability to look a bit askew at the world and distill the world into sly, aphoristic lines—much like tweets. His truncated sentences are not quite lyrical enough to be poetry, but they can seem as if they are cribbed from rambling prayers. The Jesuit Walter Ong’s insights have proved predictive of our digital present. McLuhan’s ideas are often porous and therefore so often misunderstood. He was a disruptor. Yet his ultimate goal was not the “opaquities and obliquities” of value judgments, but rather he was “interested in understanding processes.” McLuhan was inspirational, and that can be clearly seen in the work of his former student, Walter Ong. McLuhan’s cryptic sayings are perfect for bumper stickers. Ong’s insights in The Presence of the Word are far more scholarly, yet no less predictive of our digital present. We are living those transmutations now, and Ong’s questions remain: “Could the cry of Nietzsche’s madman, ‘God is dead’, derive from the fact that He cannot be readily found by the old signs in the newly organized sensorium where the word stands in such different relationship to the total complex of awareness by which man earlier situated himself in his life world?” Ong and McLuhan were both observers; rather than attempting to stop the tide of electronic change, they wanted to understand its rise and fall. Meanwhile, another Catholic seemed content with riding that tide. In 1967 Warhol was staging his multimedia “Exploding Plastic Inevitable” events across the country. Strobe lights pulsed. 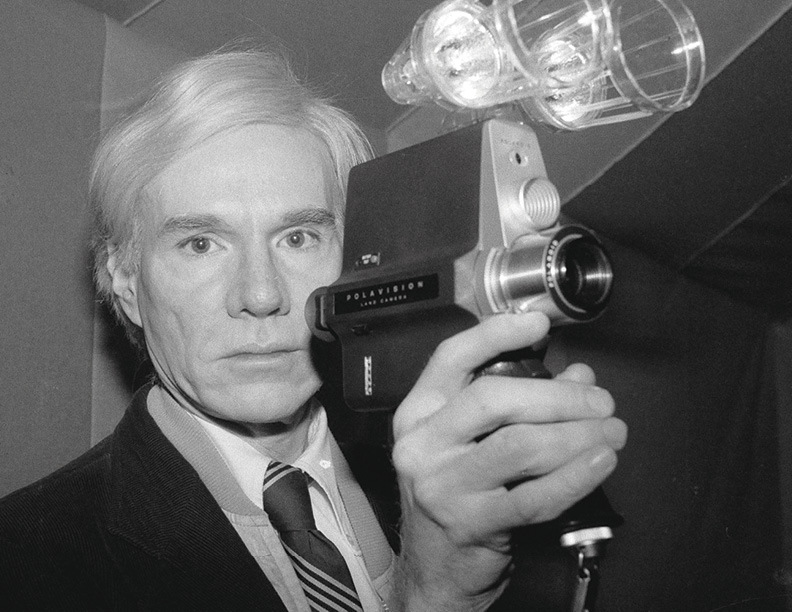 Projectors reeled Warhol’s films against the walls. Dancers and their shadows cut through the images. Loudspeakers boomed simultaneous pop songs. The Velvet Underground, the band Warhol managed and produced in his own Warholian way, played live. Warhol’s hidden Catholicism was never truly hidden. Warhol surrounded himself with Catholic artists, photographers, poets and managers: Fred Hughes, Gerald Malanga, Paul Morrissey, Bob Colacello, Natasha Fraser-Cavassoni, Christopher Makos, Robert Mapplethorpe and Vincent Fremont. The same year he created the “Exploding Plastic Inevitable” spectacles, Warhol created a silkscreen series of Marilyn Monroe. The portfolio’s varying shades and colors take an endlessly recycled face and imbue transformative life. There is something vaguely liturgical in Warhol’s recursive method. The Prescience of Walter Ong, S.J. This is not to say that such pop work was devotional; Warhol saved that for his Last Supper sequence. Alexandre Iolas commissioned Warhol to create a series based on Leonardo da Vinci’s famous work. For an artist who had made the mundane mystical—think soup cans and soda bottles—this was a different context. It was a print masterpiece resurrected, an artistic word made flesh: draped in camouflage, silkscreened, infused with layers of pop and piety. Warhol created over 100 takes on Leonardo’s creation, his repetition suffused with the rhythm of prayer. McLuhan did not live to see it, but he would have appreciated it. Somewhere between Warhol’s public glam and his private, blue-collar Catholicism rested a spirit similar to the “inscape” of Gerard Manley Hopkins, the belief that even the most mundane and artificial objects existed in a divine world. Warhol’s fascination with death was the acknowledgment of his own mortality—perfectly appropriate for someone drawn to the life of Christ. Fifty years ago, McLuhan, Ong and Warhol watched the electronic age arrive and did not blink. They found eternal patterns, moments of illumination, a new opportunity for communion, clarity and mysticism. Is God in the machine? We don’t know. But if we follow the lead of those Catholic visionaries, we should allow ourselves to be surprised. All the tools and engines on earth are only extensions of its limbs and senses. Carl Williams introduced McLuhan to the term Auditory/Acoustic Space resulting from conversations with Jacqueline Tyrwhitt. A sphere whose centre is everywhere and whose margin is nowhere, around 1954. Warhol reflecting on dinner with McLuhan thought he was boring due to Marshall not talking when Warhol's tape recorder was on. McLuhan felt it better that Ong be a rival rather than disciple. McLuhan felt no authoritative connection to the Medium is the Massage book, called it a pamphlet, viewed it completely as a result of Agel and Fiore, whose share was greater than McLuhan's as well. Finally, regarding morals, McLuhan stated when you're on the air you don't have a body, no body, no identity, no identity, no morals. Warhol was introduced to bullets (reportedly 7 of them) by Feminist Icon Valerie Solanas, who felt he deserved shooting as one who dared disrespect the writings (Like the tale of 'Bongi') of a Feminist Icon. Warhol refused to press charges at the time, thus denying 'Bongi' of the show trial she so desperately craved - in order to hawk her book(calling for extermination of Male XY Scum) "The SCUM (Society for Cutting Up Men) MANIFESTO"..
SSADLY, Solanas never got the rest of her 15 minutes of fame and blew the rest of her head gaskets out before blowing off the head itself. Slight typo in McLuhan's book: The Medium is the Message not "The Medium Is the Massage"
This article also appeared in print, under the headline "A Catholic Media Trinity: McLuhan, Ong and Warhol," in the January 8, 2018 issue.